Keep little minds ticking with this Vtech Toot-Toot drivers construction site which has plenty of fun, fully interactive features. This role-play construction site encourages imaginative play, as they watch the dumper truck and other Toot-Toot Driver vehicles react to the 6 SmartPoints that introduce fun phrases, sound effects and melodies. 5 SmartPoint sensors that trigger vehicle responses. 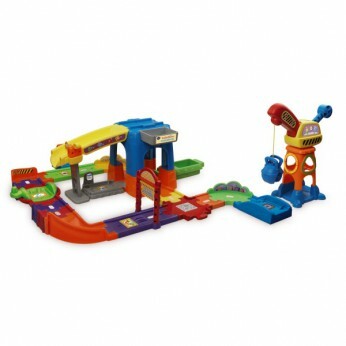 Features crane to left and move, shape sorters and ball drop play. Lots of manipulative features of imaginary play. Able to connect into different combinations and to other Toot-Toot play sets. One supplied; Size H33, W45, D16.3cm; Batteries required: 2 x AAA (included); For ages 1 years and over; EAN: 3417761466032. WARNING(S): Only for domestic use; To be used under the direct supervision of an adult. This toy does not provide protection. This toy costs approximately £29.99 (for the latest and best prices make sure you check our retailer list for the Toot-Toot Drivers Construction Set above). In our review of Toot-Toot Drivers Construction Set we classed it as being suitable for ages 1 to 3 years but recommend you check the manufacturer specific advice before purchasing.